Punjab Chief Minister Shahbaz Sharif has directed the Rescue 1122 staff to launch motorbike medical services in case of emergencies in crowded areas of Punjab. 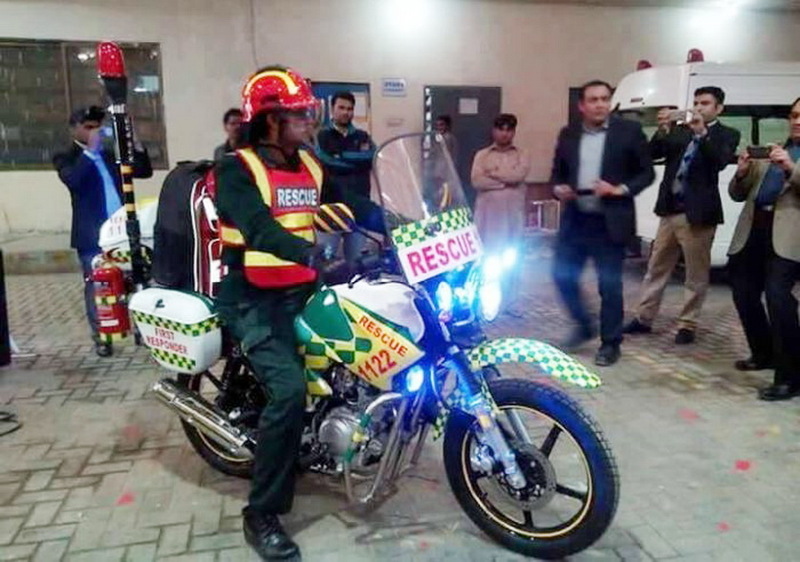 Director General of Punjab Emergency Service Dr. Rizwan Naseer said that Rescue 1122 will recruit about 800 paramedical staff to start motorbike emergency services in 9 district headquarters of Punjab which include Lahore, Sargodha, Rawalpindi, Multan, Bahawalpur, Faisalabad, Gujranwala, Dera Ghazi Khan and Sahiwal. The congested areas with heavy traffic where it is difficult to reach in rush hours, motorcycles ambulance will give first aid to the injured people. The CM Punjab has approved the “Quick Response medical staff jobs” in all big cities of Punjab. The applications are invited from Emergency Medical Technicians (EMTs) by National Testing Service (NTS). About 300 recruitment will be made in Lahore, 100 each in Rawalpindi and Multan, and 50 each in Bahawalpur, Gujranwala, Dera Ghazi Khan, Faisalabad, Sargodha and Sahiwal. DG claimed that this will be a good job opportunity for qualified diploma holders with driving licenses. DG also ensured a transparent process of recruitment. Various tests will be conducted like written, psychological, physical and driving skills. After that qualified candidates will be called for interviews. The last date to apply is January 8, 2017. Details about job advertisement can be seen here. The post Rescue 1122 to launch Motorbike Ambulance Service appeared first on TechJuice.